Don’t you just love that Friday feeling? When the end of the working week comes along, we can all look forward to a well-deserved break filled with fun and relaxation. If there’s one way to make the start of your weekend even better, then it’s kicking back with a great game of bingo and (hopefully) coming away with a big pile of cash winnings. That’s exactly what’s on offer with the Fab Friday bonus at Bucky Bingo. This fabulous bonus treats players to £10 free bonus bucks in return for purchasing £50 of bingo tickets on a Friday. Keep on reading to find out more. 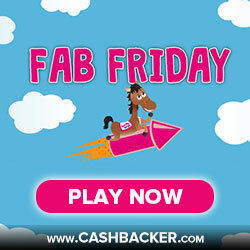 The Fab Friday bonus is an ideal way to start your weekend if you’re an avid bingo lover. All you need to do to qualify is log into your Bucky Bingo account (or register for the site if you’re not yet a member) and stake at least £50 on bingo tickets. Your account will immediately be credited with £10 in bonus funds. This £10 can be enjoyed at any of the many games at Bucky Bingo, and with nine rooms and thousands of pounds in jackpot prizes waiting to be won; this can go a long way. It’s important to note, however, that your bonus must be wagered 20 times before you are able to withdraw your winnings. The Fab Friday promotion kicks off at the stroke midnight every Friday and remains active until 23:59 that night. The bonus funds can be enjoyed in any of the bingo rooms and slot games that Bucky Bingo has to offer.